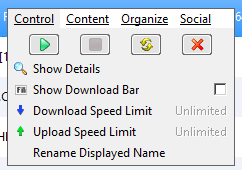 menu thingy when you right click a torrent is useless. The old style was much better. Is there a way I can downgrade or get the old menu back? I have the same problem Regardless of the torrent I search for, I get pages and pages of stuff I did not look for and have been unable to find one that I want. I use - and pay for - Vuze+ but it is now completely useless. I can find no way of communicating with Vuze directly for information or advice on how to correct this nor can I find any way of asking for my wasted money back! Vuze has always seemed to be a very good service but, it seems, the wheels have fallen off! What can I and all the others who feel the same way do about this? How do we communicate directly with them? They cannot hope for the Forum to solve their problems for them.